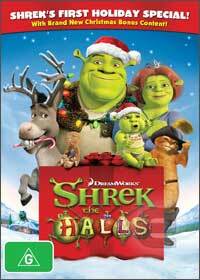 Originally made for TV, Shrek the Halls is now available to own on DVD that once again reunites the cast of Shrek in this Christmas parody which will have both the kids and adults in hysterics. Best of all, Mike Myers returns to voice Shrek, Eddie Murphy as Donkey, everyone's favourite, Antonio Banderas as Puss in Boots and the delightful Cameron Diaz as Princess Fiona which truly lends credibility to this Christmas special. The story revolves around Shrek who is trying his dandiest to get into the Christmas spirit. He vows to make this the most memorable Christmas ever for his family and as fate would have it, things don't always go as planned as Shrek's friends crash their Christmas party. With over the top humour and a great story, the only drawback to Shrek the Halls is the animation that is a little less polished than the movies. Even so, it's definitely one for the fans and features some great extras that will keep the kids entertained!